Let her “steal” your evening and she promises her thieves will steal your heart! J. A. Devereaux is passionate about the thief who really isn’t a bad guy, guys like Alexander Mundy (“It Takes A Thief”); Neal Caffrey (“White Collar”); and the “Leverage” crew; REQUISITION FOR: A THIEF’s Gregg Hadyn, Niki Grey, and Jaelynn Madding; and Thief a la Femme’s Rayla Rousseau. Such characters motivated her extensive knowledge of diamonds and her own thieving skills–strictly for research and writing purposes, of course! A long-distance runner, former cross country coach, and former singer/songwriter, Devereaux resides with her husband in Jackson, Michigan. Intended for Adults & Teens. Celebrate the start of the Holiday Season at the Carnegie Branch! Visit with “Santa” and receive a FREE book starting at 5 p.m. Enjoy special crafts and activities for the kids! Listen to LIVE Holiday music! Visit the “Friends of the Library” Book & Bake Sale! Enjoy a hot dog and hot cocoa on the front lawn while watching the Jackson Holiday Parade (starts at 6 p.m.). All proceeds from the sales benefit the Youth Services Department of the Jackson District Library! ‘Tis the season for the “Friends of the Library” Holiday Book Sale! Start your holiday shopping at the Friends’ annual Holiday Book Sale. Come down on Friday from 4 to 8 pm for the Carnegie Library’s Holiday Open House. This sale, one of two per year offered by Eastern’s Friends of the Library, offers fiction and nonfiction books, juvenile and young adult books as well as movies, music, and magazines. There’ll be approximately 5,000 items to choose from. On Saturday it’s a $1 per bag. 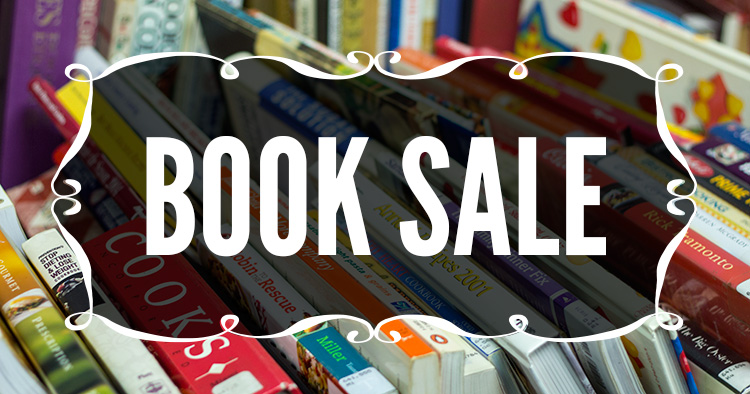 October is here and it’s the perfect time for a scarily good book sale! Spring Arbor’s Friends of the Library are having their Fall book sale. Stop in and see what treasures you can find! Friday will be a $1 per bag fill day (bags provided). Join us at the Meijer Branch! This HUGE book sale starts on Wednesday, October 10 and goes through Saturday, October 13. $1/bag sale on Saturday, October 13. Books, media, music, movies, children’s books, and more. Material for all ages, and at prices you just can’t beat! Wednesday, October 10 from 9 a.m. to 7:30 p.m.
Thursday, October 11 from 9 a.m. to 7:30 p.m.
Friday, October 12 from 9 a.m. to 5:30 p.m.
Saturday, October 13 from 9 a.m. to 3 p.m. The Parma Branch invites you to their annual big book sale during Parma Harvest Day! Books, DVDs, and CDS for all ages!